Since I'm working on a large spinning project, I decided on the spur of the moment to pull out the handspun stash and take stock of what's been marinating in there. It's not a bad pile actually. That's everything right there from the past 2.5 years that hasn't been knitted up into something or given away (there are some scraps and leftover bits of skeins floating around that didn't make it into the picture). 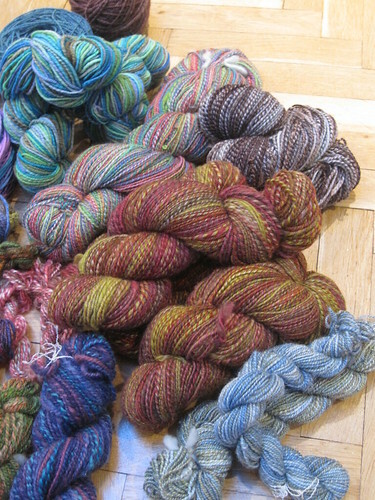 Far and away the largest portion of my handspun stash was dyed by Adrian. Click on the photo for notes including colorways. I feel very lucky to have gotten in to the Hello Yarn club right at the beginning, but I feel like the pile should be bigger. May 2007 - Dec 2009 is a lot of months. 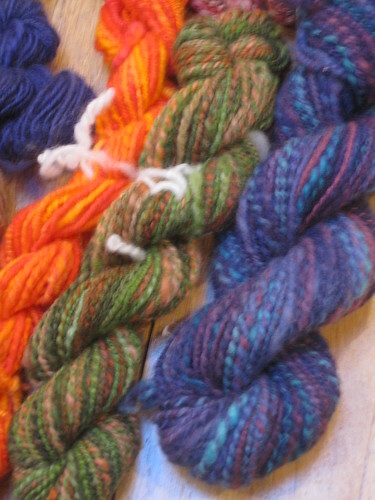 But I guess I'm not showing you the fiber stash...there's a lot in there that hasn't been spun up yet. 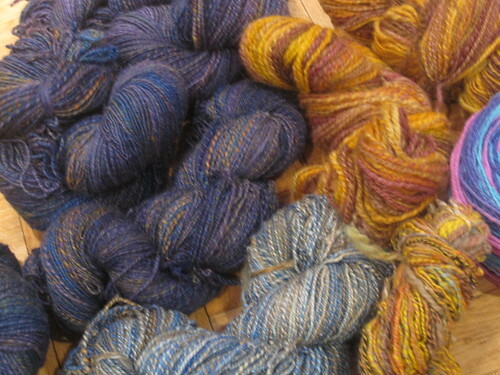 Then there are my first skeins of hanspun, done on a Golding spindle. And my first dyeing experiments with Wilton's dyes. 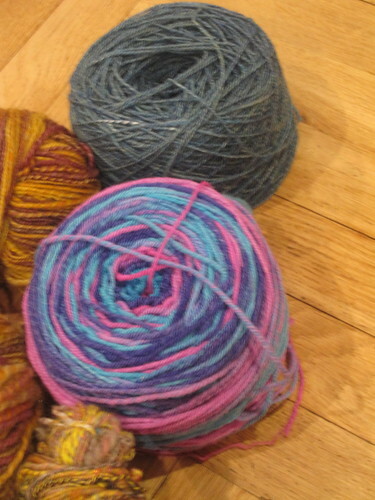 Then there's the stuff from Yarn School Fall 2009. What's left of Devil's Merino and the mystery fiber from Diane that I spun recently. And finally, the few skeins I've bought or been given. 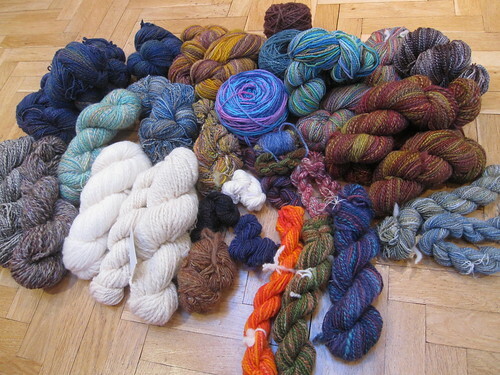 All in all, somewhere north of 4100 yds of handspun yarn. Hmmm....might be time to get cracking, no? 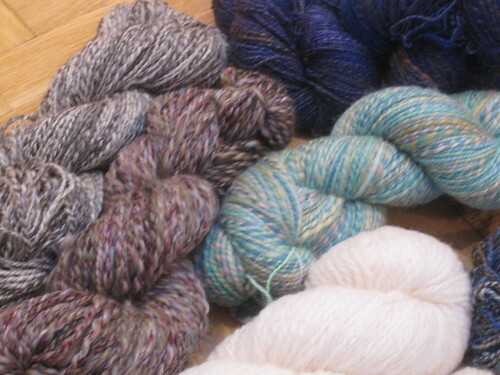 Although I seem to be in the process of adding to the handspun stash instead of reducing it. But that Buckland and the YS Corriedale are pretty tempting, not to mention Peat. 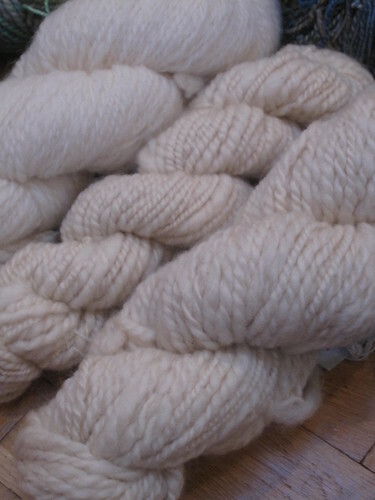 And Hooray Sheep might make a nice Lacy Baktus... Where to start? Written by porpoise On January 28, 2010 In "spinning"